the lakshmi narayan temple at 18th road, khar is a sufi-inspired temple, and quite unlike most others. along with the regular pantheon of hindu gods and goddesses - there's everyone from sai baba to balaji and ram to shyam; there are also a number of ascetics and saints that have been enshrined here. most of these were native to sindh (in current pakistan); and have been followed by sindhis for quite some generations now. with independence came partition, and a large number of sindhis migrated to mumbai. many of the affluent populace of the community stays in khar (west), and that explains the presence of this temple here. it also explains the overdone silver coating to every surface, ornate wall panels, golden chandeliers, multi-storeyed buildings standing behind shikhars, halls for rent in the basement and of course the marble courtyards etc. seems that every temple which gathers enough funds, wants to first cover its courtyard / open spaces in white marble (classic example being the gokarnath temple in mangalore. see pic here) (but, thank god that haveli on 10th road, jvpd doesn't do the same). anyway, that's a different topic and a complete deviation from what i started off with. coming back to lakshmi narayan temple: because of the sufi traditions, certain islamic ideas / iconography also seem to be incorporated. allah maalik is prominently written at many places, in sindhi, hindi and english. also, a green crescent moon and a star appear as prominently as the sun. and the usage of green colour is as much, if not more than usage of saffron colour. on a side note, the angles guarding the doorways were very similar to the ones in churches, hogh above the altar. and best of all, in one corner, at the end of all the gods, goddesses and saints, there was a statue of zarathustra, the founder of zoroastrianism. multi-religion-ism at its best? see other photos in mindless mumbai about festivals and festivities here. Hi, seasons greetings from another Mumbaiite. Great photo and information about this temple. Surprisingly, I've never been there but I will visit when I go to Khar. This is a great photo. And you are a good guide. I loved reading your words about this temple. By the way, thanks for the advise. How very interesting! 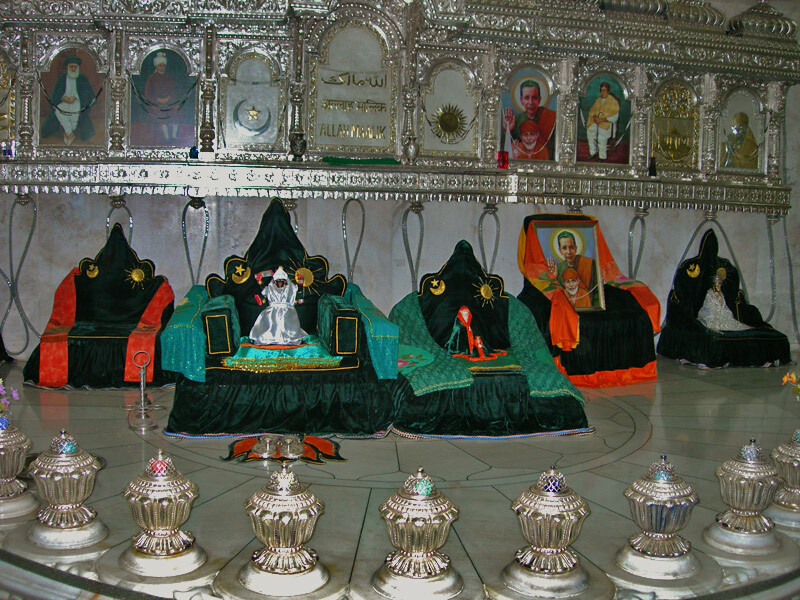 You know, one of the things I have always wanted to do in India is see Sai Baba. Thanks for visiting Norwich Daily Photo and for your wonderful comments. Sorry if I wasn't able to visit you sooner - very very busy house hunting! Very interesting post and beautiful shot. you are an incredible photographer and i love reading your blog. How come I never see these things when I come to Mumbai? You are taking me next time! I love "multi-religion-ism"
ive lived in this teeny weeny suburb which cannot be more than 15mins walk across all my life! where on earth is this temple??? is it close to khar danda???? Hi, a lot of blessings come from this temple. Hi! The beauty and tranquility of this pure abode is unmatched.Even the most beautiful adjectives are less efficient in the description of this mandir. Anybody,from anywhere, can reach this temple -only if SAI wishes so.Great joy and abundance to the temple!